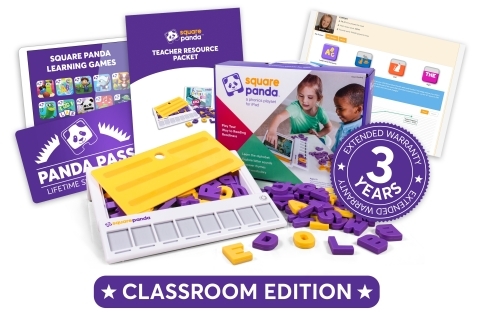 SUNNYVALE, Calif.--(BUSINESS WIRE)--Today, Square Panda, developer of the award-winning multisensory phonics learning system, announced the Square Panda Classroom Edition to allow educators enhanced access to Square Panda’s tools and games that support reading skill development. The Square Panda Classroom Edition helps turn students into fluent readers and builds their foundation for future educational success. Square Panda also announced the Panda Pass, a component of the Classroom Edition, which is a lifetime subscription to all current and future Square Panda learning games and gives teachers an account with up to 30 student profiles. Through the Classroom Edition teachers also have access to the Square Panda Teacher Portal, which allows them to manage student profiles, personalize learning experiences, monitor student progress and identify opportunities for further learning. 66 percent of students are not reading at grade level by the time they enter 4th grade*. Helping students build phonemic awareness and phonics leads to better vocabulary, higher fluency, and ultimately comprehension. The Square Panda learning system offers a multisensory learning experience, which improves retention and makes learning to read fun. Children stay engaged in their learning through Square Panda’s growing library of learning games, all of which are grounded in research. Children are guided through their play experience as they learn through tactile interaction with the alphabet, explore letter sounds, discover rhymes and build vocabulary. The Square Panda Classroom Edition is sold at MSRP $169.99. The Square Panda Home Edition is sold at MSRP $119. Both editions are recommended for children ages 2-8 years. All Square Panda games are free to download from the App Store or Google Play. Tablet not included. Visit the Square Panda FAQ on www.squarepanda.com for details on supported tablets. For more information on the Square Panda Classroom Edition, visit www.squarepanda.com/schools. For access to media assets, please visit here. Square Panda™ is the award-winning complete phonics learning system with multisensory play. Designed for kids two and older, the playset blends physical and digital learning as it keeps kids entertained through age-appropriate learning games grounded in research-based curriculum. Early readers play their way to reading fluency as they engage with physical smart letters that connect them to a library of learning games. Every play session guides children as they explore the alphabet, letter sounds, discover rhymes, build vocabulary and more. For more information, visit www.squarepanda.com.